Like every business sector, public relations has some challenges at the moment, but what makes communications such an exciting place to work in right now is that, for me anyway, the opportunities outweigh the threats. The issue is that if PR doesn’t respond to and deliver on these opportunities, we'll miss the boat. By that I don't mean that the public relations sector will disappear; I don't think that will happen, but we won't reach our potential in terms of the breath and importance of work that we do. Renee Wilson, global chief client officer at MSL, talked to delegates about the changes happening in PR firms, including the external influences of the PR ecosystem. # The challenge of finding enough talent. For me this comes down to some simple numbers. If your agency is growing at 15% and you have a staff turnover of 15%, if you have a 100-person agency then you are going to have to find 30 new people. That’s 30% of your workforce and that is going to be difficult to do. Especially when most of your competitors are doing the same. The root cause of the problem is actually positive, but the solution is challenging. 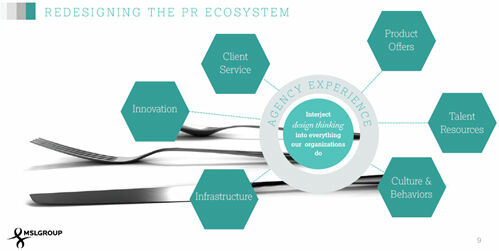 Especially when the skill sets of the people PR agencies need to employ are changing so rapidly and the methods that PR firms used to use to recruit cost effectively, for example specialist job boards, no longer work. Treat your current staff better. Retain spare capacity. If the business can afford it, hang on to your good people even if you lose the odd client. Promote from within, a sure way to retain your best staff. 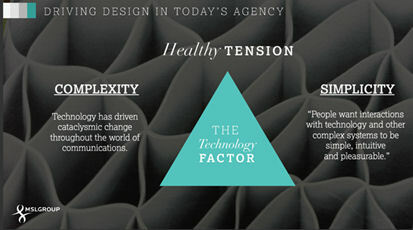 Invest in your agency brand. Invest in a training scheme that has a structure, is valued by staff and positively incentivises people to stay with you. Hire more graduates; you’ll lose some, but you’ll keep some. Do better client work. If your employees are proud of their work, they'll be happier and less likely to leave. Get better clients. If you've got a client who treats your people like shite, sack the client. Sort out your flexible working programme. Make working at your firm easier for parents than your rivals do. For many clients creativity is vital. Creativity in PR is different in the way it manifests itself from creativity in other areas of the marcoms mix. That said, creative concepts that use big ideas to tie an integrated, cross channel campaign together are clearly the way to go. That’s inarguable and I don’t think it matters whether the PR firm comes up with the idea, the ad guys, the clients or whoever. But I would issue one note of caution for PR – I would very be careful about defining creativity in public relations as the same as creativity in advertising. For me, very often (not always) creativity in PR campaigns is a different type of creative thinking than I see in advertising campaigns. With that in mind, Cannes is a great scheme to be involved in. I’m not suggesting not entering it, but global agency heads seem almost obsessed by it. It is dangerous to let success/or failure at any awards ceremony define your business, let alone your profession! So I'd encourage PR people to be confident about their creative credentials, not paranoid. My favourite presentation of the summit was Guto Harri’s talk around authenticity. He discussed the need for communications to be authentic, real and true. Guto regarded Tony Blair as one of the world’s great communicators who in the end abused the art of communications by not being authentic. There is much bleating about the importance of ethics in PR at the moment (in the UK anyway) but as this is such an obvious debate, it quickly becomes frustrating; I just don't believe PR people are en masse dishonest. Sure there are a few bad eggs, but that is the same in every profession. A far more interesting, less obvious and helpful discussion is the need for communications to be authentic. 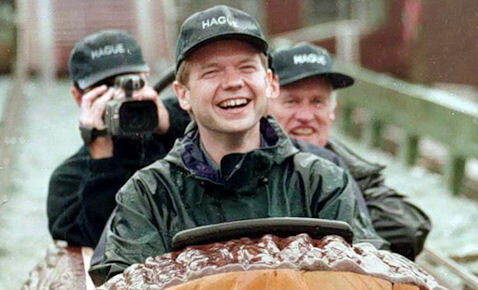 For example, in the image to the right, former UK Foreign Secretary William Hague was a serious man who would never have worn that cap, so the PR guy who is responsible for that shot (many years ago) made an error because the image is not authentic. It is not believable. Guto believes communicators today still make these errors, and they do the reputation of the profession, their clients and themselves no good whatsoever. So if your next campaign isn’t authentic and true to the values and capabilities of the product or firm you represent, don’t do it – because it won’t work! Hailing a cab from the street in Milan, as far as I can tell, is impossible. Just doesn't work. I don't think they are allowed to stop. So don't even bother. The taxi ranks are equally depressing; no taxis ever turn up. If you want a cab in Milan, order it from your hotel. Works a treat. Uber worked well for some people out there, not for me.